For everyone that likes flying and like to play interesting adventure games on their phones, nowadays you can find hundreds of games that offer you to have fun while challenging you to progress and win high scores. Because it’s hard to search and choose a great game that offers you adventure, excitement and challenges, we decided to help you and we found for you one incredible flying adventure game – Sky Jet War. Let’s see what the game has to offer you. This adventure flying game is developed for android users as one very entertaining and challenging flying game that offers players to test their skills while having fun flying a cool jet. Suitable for any age and with a simple interface, the players will enjoy the HD sharp graphics and cool flying sound effect each time they play the game. All players need to do is to be precise by avoiding the many obstacles, while flying their ship as high as possible to win the highest scores and become the ultimate flyer! The Sky Jet War is keeping players interested in the game constantly by offering them different challenges and testing their skills each time they play and fly their jet ship. Players can play the game simply by holding the ship on the screen to drag it across the sky. One simple task is given to players in order to progress. Players just need to fly their ship as higher as possible while avoiding a lot of obstacles on the way. 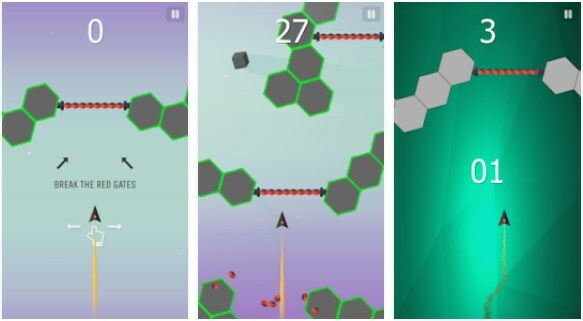 Flying in the sky and moving the ship, players need to break the red gates to win points and avoid the geometrical shaped obstacles in the same time. Each player that hits an obstacle will lose the game and will need to start again. The game has many power-ups that the player needs to collect which will help him out through the game. All the credits that are collected by the player can be used for unlocking new ships and moving into another challenge to test the flying skills of the player, keeping him interested in playing. Longer in the sky, higher the scores! Download this game for free on Google Play and challenge your flying skills!